The Filipino Pork Barbecue (Pork BBQ) is everyone’s favorite where the skewers are grilled on fire right in front of you. 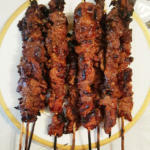 It is a marinated slice of pork thread on a skewer and grilled to perfection. During summer vacation, it is the time for me and my family to relax, sit back, and get a sunburn, play and having fun. It is the only thing that as a family really look forward every year. A relaxing picnic with my family and friend is the perfect way to enjoy a beautiful summer’s day. 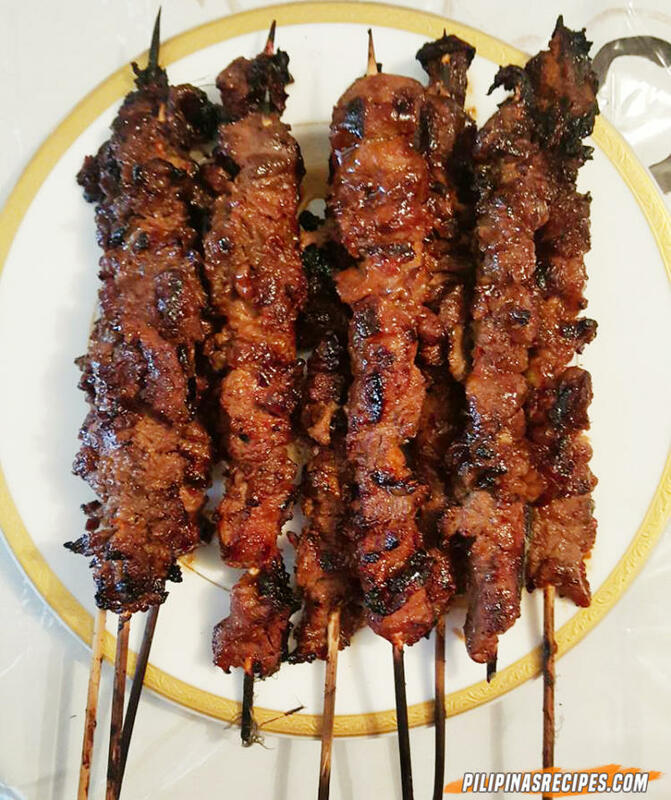 This Pork Barbecue Recipe is one of my favorites aside from the Filipino Chicken Barbecue and my family always request every time we have a swimming. This Pork Barbecue tastes great and I was able to cook them for a family picnic. Pork is a delicate meat and it needs a gentle heat for barbecuing. Food cooked over coals or glowing embers has an exciting flavor. 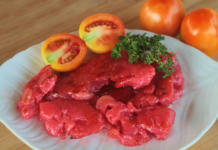 When I choose cuts of meat to barbecue, I look for flesh that is light pink with creamy white fat, this indicates a tender cut. Meat to be barbecued generally need little preparation. This is simple to make but it does take a little bit of time to Marinate. Marinating the pork longer the better the taste (Overnight). 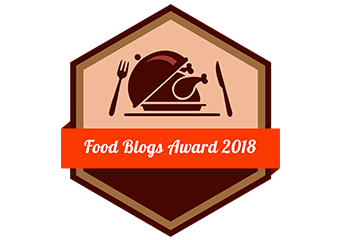 For making this Pork Barbecue Recipe, Pork should be marinated in soy sauce, crushed garlic, calamansi juice, black pepper, brown sugar, banana ketchup, and a can of Sprite or 7-Up. Refrigerate for at least one hour or up to overnight. After I marinate and refrigerate the pork, I allow the meat to come back to room temperature before barbecuing. This is to ensure even cooking of meat. String the marinated pork on skewers. Grill on medium heat until cooked with continuous turning and basting. 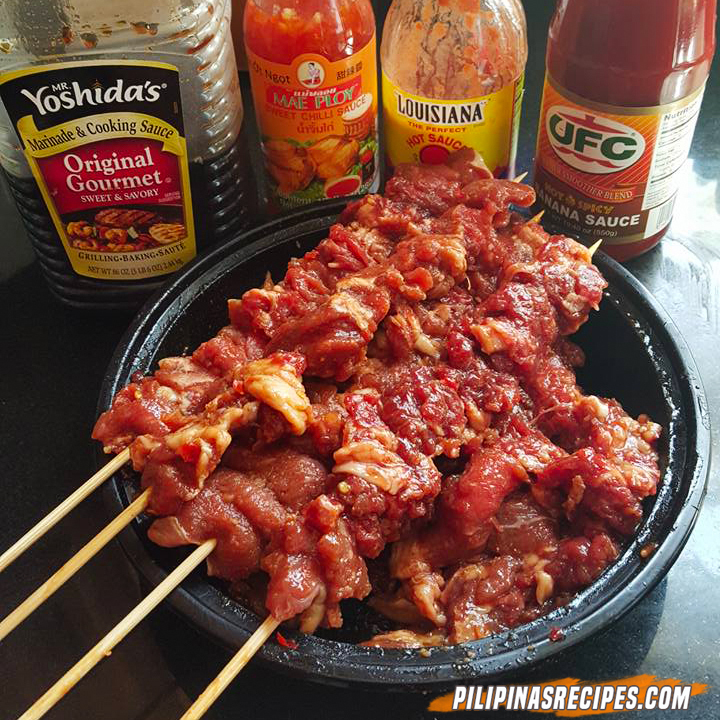 The Filipino Pork Barbecue (Pork BBQ) is everyone’s favorite where the skewers are grilled on fire right in front of you. 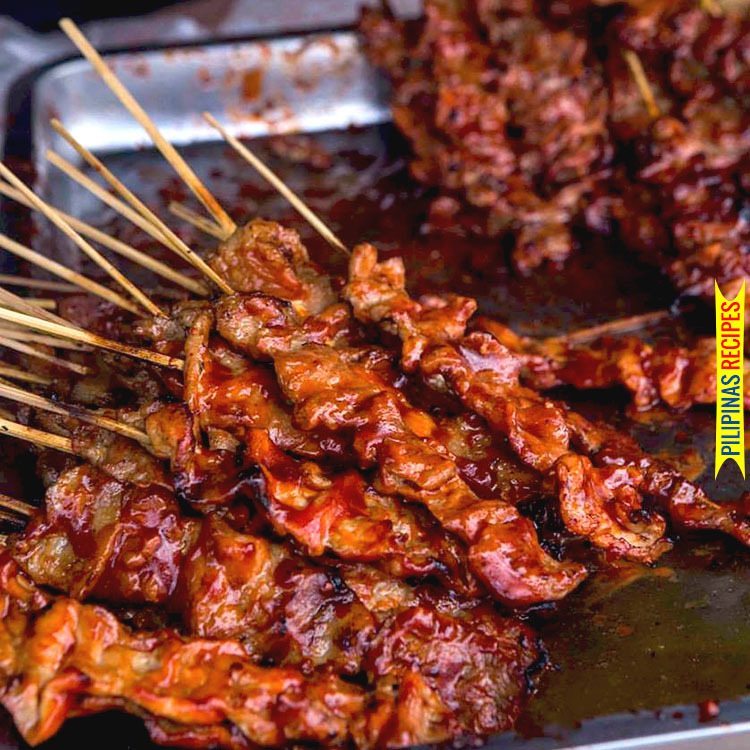 It is a marinated slice of pork thread on a skewer and grilled to perfection. In a Bowl, Mix all the marinated ingredients together. 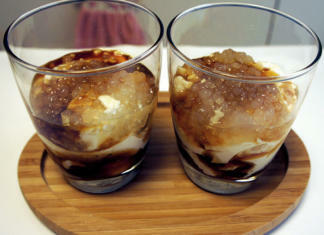 Minced garlic, soy sauce, calamansi juice, Ketchup, half of the ginger ale, salt, black pepper. Leave the ½ cup of the marinade plus the sugar, aside from the grilling glaze. Pour the rest of the marinade on the Pork. Cover the Pork with plastic wrap and refrigerate overnight. Pre-soak the bamboo skewers in hot water for 15 minutes. Skewer the Pork on a bamboo stick with up to 6 pieces per stick. Prepare the Grill and Pre-Heat. Prepare the remaining Sauce / Marinate from the day before. Add Sugar and the remaining Ale. Grill the barbecued pork, about 10 minutes on each side while rotating the skewers. Total grilling time should take about 20 minutes. When cooked, serve hot with “Atsara” or Hot Rice. 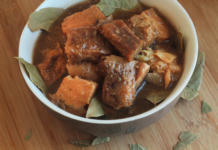 This video shows another recipe for Filipino Pork Barbecue. Remember to soak bamboo skewers in cold water before use to prevent them burning while barbecuing. Pork Barbecue would be perfect dipped in vinegar, chopped onions, and chilis. Questions Regarding the Recipe? Comment below. 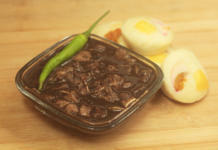 Support and Visit our Facebook Page for more Filipino Recipes. You can also buy a ‘Boneless Pork Picnic Shoulder’. That slices and absorbs marinade quite well also…. Can I use chicken thighs? It’s all I have. if i were to do this in an air fryer.. whats the setting and for how long. im interested makin this.. as i live in high rise area not allow grilling.. help.. or how long to do it in the stove.